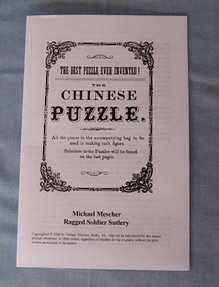 This puzzle supposedly dates from ancient China back to somewhere around 1000 BC -- or so the story goes. But, even if it isn't of such ancient lineage, we have seen patterns for it in books from the early 19th century on through to modern times. The puzzle is very simple in concept, consisting of five triangles of three different sizes, a square, and a parallelogram or rhombus. The player is presented with a silhouette and then tries to make the silhouette by using all the pieces but turning or positioning them at will. Some of the shapes to form are simple geometric shapes, e.g., a large square, a rectangle, and a large parallelogram, but the shapes become more complex and fanciful as you progress. 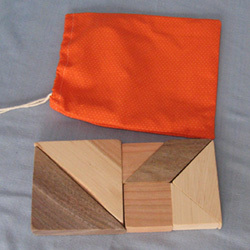 When all the pieces are used to make a square, the result is a figure about 5 1/4 inches square. The set comes with a booklet we prepared (see the last picture) that gives the legend behind the puzzle as well as 24 patterns (and solutions!) we found in sources from before or during the civil war period.